By respecting heaven and the earth, humankind enjoys a harmonious life. Even farmers in revolt put out banners proclaiming “achieve the Way on behalf of heaven.” Lao Zi said, “There is something mysterious and whole, which existed before heaven and earth, silent, formless, complete, and never changing. Living eternally everywhere in perfection, it is the mother of all things. I do not know its name; I call it the Way.” This suggests that the world is formed from Tao. “Man follows the earth, the earth follows heaven, heaven follows the Tao, and the Tao follows what is natural.” In ancient China, people believed in complying with, harmonizing, and co-existing with heaven. Humankind integrates with heaven and earth and exists in mutual dependence with them. The Tao of the universe does not change, and the universe runs according to the Tao in an orderly manner. The earth follows the changes of heaven and therefore has four distinct seasons. By respecting heaven and the earth, humankind enjoys a harmonious life of gratitude and blessings. This is reflected in the expression “heaven’s favorable timing, earth’s advantageous terrain, and harmony among the people.” According to Chinese thought, astronomy, geography, the calendar system, medicine, literature, and even social structures all follow this understanding. But the Communist Party promotes humans over nature and a philosophy of struggle in defiance of heaven, the earth, and nature. Mao Zedong said, “battling with heaven is endless joy, fighting with the earth is endless joy, and struggling with humanity is endless joy.” Perhaps the Communist Party did acquire real joy from these struggles, but the people have paid tremendously painful costs. A human being is first a natural being and then a social being. “Men at their birth are naturally good” and “The heart of compassion is possessed by all people alike” are among the many guidelines that human beings bring with them at birth, guidelines that enable them to distinguish right from wrong and good from evil. However, for the CCP, human beings are animals or even machines. According to the CCP, the bourgeoisie and the proletariat are just material forces. He believed that the entire human history is nothing but the continuous evolution of human nature, and that human nature is in fact class nature. He posited that there is nothing inherent and inborn—everything is produced by its environment. Marx argued that a human being is a social man, disagreeing with the natural man concept postulated by Feuerbach. Trotsky even vainly hoped that conditioned reflex would not only psychologically change a person, but also physically change the person. In the same way that a dog drools once it hears the lunch bell ringing, soldiers would be expected to rush ahead bravely upon hearing gunshots, thus devoting their lives to the Communist Party. Since ancient times, people believed that effort and labor leads to reward. Through hard work, one was thought to gain a prosperous life. People had contempt for indolence and considered reaping benefits without laboring as immoral. After the Communist Party spread to China like a plague, however, it encouraged social scum and idlers to divide land, rob private property, and tyrannize men and women—all were done publicly under the color of law. Everyone knows that it is good to respect one’s elders and care for the young, and bad to disregard elders and teachers. Intellectuals were classified as the stinky ninth category. The ancient Confucian education had two parts: “Xiao Xue” (Small Learning) and “Da Xue” (Great Learning). Xiao Xue education, received by children below 15, mainly focused on manners regarding cleanliness, social interactions, and etiquette (education on hygiene, social behavior, speech, and so on). Da Xue education emphasized virtue and acquiring the Tao. During the CCP’s campaigns to criticize Lin Biao and Confucius and to denounce respect for teachers, the Party erased all moral standards from the minds of the younger generation. On Aug. 5, 1966, Bian Zhongyun, a teacher of the Affiliated Girls High School of Beijing Normal University, was paraded by her female students on the street, wearing a tall dunce hat and clothes stained with black ink, carrying an insulting black board over her neck, in the midst of the students’ drumming on dustbins. She was forced to her knees on the ground, beaten with a wooden stick spiked with nails, and burned with boiling water. She was tortured to death. The female principal of the Affiliated High School of Peking University was forced by students to knock on a broken washbasin and yell, “I am a bad element.” Her hair was cut messily to humiliate her. Her head was beaten until it gushed blood as she was forced down to crawl on the ground. Everyone thinks to be clean is good and to be dirty is bad. 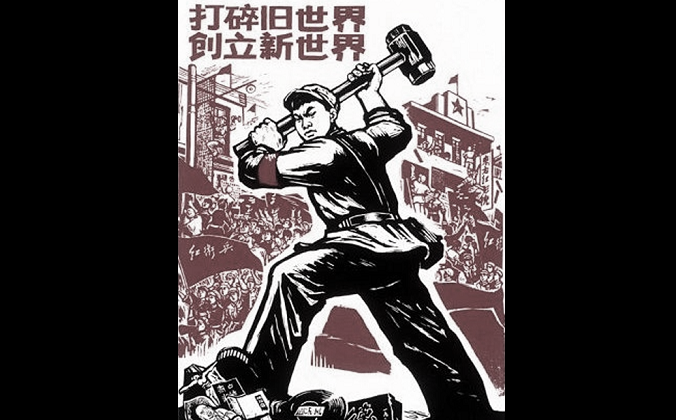 But the CCP promotes “getting mud all over the body and covering your hands with calluses” and praises as good that your “hands are dirty and feet smeared with cow-dung.” People like this were considered to be the most revolutionary and could attend universities, join the Party, be promoted, and eventually become Party leaders. Humankind has progressed because of the accumulation of knowledge, but, under the CCP, gaining knowledge was considered bad. Intellectuals were classified as the stinky ninth category—worst on a scale of one to nine. Intellectuals were told to learn from illiterates, and to be re-educated by poor peasants in order to be reformed and start new lives. In the re-education of intellectuals, professors from Tsinghua University were banished to Carp Island in Nanchang, Jiangxi Province. Schistosomiasis was a common disease in this area, and even a labor camp originally located there had to move. Upon touching the river water, these professors were immediately infected and developed cirrhosis, thus losing their ability to work and live. Under former Chinese Premier Minister Zhou Enlai’s instigation, the Cambodian Communist Party (Khmer Rouge) carried out the cruelest persecution of intellectuals. Those who had independent thoughts were subjected to reform and extermination, both spiritually and physically. From 1975 to 1978, one-quarter of the Cambodian population was killed; some met their death simply on account of the marks left on their faces from wearing glasses. People with conscience are forced into silence for fear of violence. After the Cambodian communists’ victory in 1975, Pol Pot prematurely started to establish socialism—”a heaven in human society” that has no class differences, no urban and rural divides, no currency or commercial trade. In the end, families were torn apart and replaced with male labor teams and female labor teams. They were all forced to work and eat together, and wear the same black revolutionary or military uniform. Husbands and wives could only meet each other once a week with approval. Lao Zi (also known as Lao Tzu, Li Er, or Li Dan), Chinese philosopher, lived in the 6th century B.C. He is credited as the author of “Tao-Te Ching” (“Dao De Jing”), the seminal book for Taoism. These expressions come from “Mencius,” Book 2. “Rhymes of Three” (“San Zi Jing”), a traditional Chinese text for elementary education. According to Zhu Xi or Chu Hsi (1130–1200), also known as Zhu-zi or Chu-tzu, a neo-Confucian scholar from the Song Dynasty, “Small Learning” deals with proper behavior, while “Great Learning” expounds on the underlying principles behind those behaviors. Source: “Classified Conversations of Master Zhu” (“Zhu Zi Yu Lei”), Volume 7 (Learning 1).